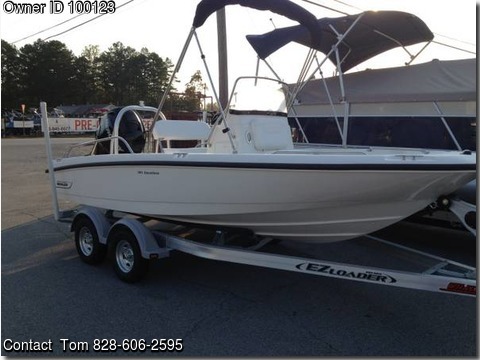 Boat is located in Ashville,North Carolina.Please contact the owner @ 828-606-2595...2013 Boston Whaler 180 Dauntless. Excellent condition with only 64.4 hrs. One owns boat equipped with a 150 HP Mercury Verado outboard with SS prop. with hydraulic steering, and has never seen salt water. Garmin 546s chart plotter / sounder. Standard Horizon GX 1600 VHF radio. Factory stereo with 2 speakers, mp3 jack, USB jack, and 12 volt outlet. Raw water wash down, heavy duty tow tower, custom full boat cover, center council, pilot seat, and engine covers. Nice dual axle trailer with disc surge brakes and spare tire. Clean boat that needs nothing. $ 48000.00 Will consider delivery.